Vegan gift baskets can make lovely, thoughtful gifts. While the range of options may at first appear limited, with a little thought it is possible to create gift baskets for vegans of all tastes. Gift baskets made up of vegan goodies make ideal presents. They can be tailored to the recipient and packed full of indulgent delights for someone who deserves a little pampering or perhaps full of themed foods. Other great gift basket ideas include hobby related baskets and these, too, can be suitable for a wide range of vegans. Toiletries can be quite a challenge for vegans. Many products are 'enriched' with milk or honey and these are unsuitable for vegans because they are obtained from animals and insects. Soaps sometimes are created using animal fats. It is important to read labels carefully. Another ingredient to watch for is beeswax. This is often used to harden lip balms or body butters. There are, however, many lovely and luxurious vegan bath products and toiletries available and these are perfect for adding to vegan gift baskets. Candles are more than just a form of lighting a home. Candles today are both decorative and functional. Many people enjoy having candles around the home as lovely household accessories. The fragrance from candles makes a good alternative to aerosol room fresheners. Many candles are created using natural fragrances such as essential oils. These make a delightful addition to a gift basket. It is important to avoid beeswax candles or any candles that have been created using animal fats. Special vegan gift baskets can be created by including a range of top quality vegan foods. These could include cookies and biscuits, candies such as vegan marshmallows, chocolates and preserves. It is important to check the labels and ensure that the products are vegan. Another thoughtful alternative would be to bake vegan products and make your own gift basket. Everyone appreciates the taste of home-cooked food and this would be extremely thoughtful, as well as being personalized and a little different. An alternative to giving someone vegan food in a gift basket is to create a basket full of interesting and unusual vegan ingredients such as quinoa. These could include vegan alternatives to foodstuffs that traditionally contain animal products. Vegan cheeses, for instance, could make an interesting gift basket item. Another alternative would be to create a vegan basket that contains a range of herbs and spices. In addition to vegan ingredients, include recipe cards, for treats such such as pumpkin pie for a thoughtful finishing touch. Vegans who have hobbies may well appreciate gift baskets that contain some special materials used in their hobby. 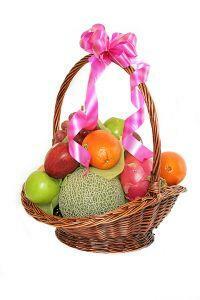 A knitter, for instance, would appreciate a gift basket that includes vegetable fibers such as soy or bamboo yarns. Organic cotton yarn is also highly prized and this can be dyed with natural dyes. Vegans interested in other fiber crafts may appreciate pieces of bamboo fabric or fabric made from recycled plastics which is surprisingly soft to touch. Vegans who are also interested in green living principles might be interested in a gift basket that contains a range of vegetable seeds. These would be great for growing vegetables organically and the basket could also include some hand tools and vegan (non leather) gardening gloves. Giving a gift basket to a vegan is an opportunity to give a present that is customized and tailored to the individual. A person receiving such a gift is bound to appreciate the thought and consideration that goes toward making such a personalized present.